Many people have flooded into Mumbai over the centuries: Hindu fishermen, Muslim kings, the Portuguese, the British, the Parsis, the Punjabis… And now the world’s design and advertising community are turning up in droves, to investigate, to network, to attend design events and to set up business. In the first nine months of 2007 alone, there were three major design conferences in India. 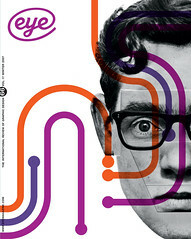 First was ‘Design Local’ organised by Icograda in February, featuring Mervyn Kurlansky, April Greiman and Lella Vignelli. In March, John Thackera hosted the latest Doors of Perception event in Delhi, entitled ‘Juice: Food, Fuel, Meaning’, bringing together innovators, entrepreneurs, educators and designers from around the world to discuss design sustainability and alternative futures. Most recently, in September, there was ‘Kyoorius Designyatra’ in Goa, where an array of international designers, including Neville Brody (whose company, Research Studios, is opening a Mumbai office next year), Kyle Cooper and Stefan Sagmeister regaled an audience of 1600 young designers with tales of Western design practice and clients. It is no coincidence that India has become the venue for such events: something extraordinary is happening. And it is something more than last year’s nine per cent national economic growth. The world is fascinated to see a nation progressing so fast, a country said to be ‘leap-frogging’ mistakes made by the West, a nation of a billion people who have everything to play for. There is no doubt that this frenzy is centred in Mumbai, a megacity of nineteen million people, and the biggest, richest, fastest city in India. Founded as a trading station in the late sixteenth century, it moved up a gear when the Suez Canal opened (in 1869) and Mumbai became the true Gateway to India. You only have to sit in a rooftop bar on Marine Drive at sunset to see the feverish trading taking place. Down on the streets too, the native Maharashtrians are sensing in the air the new possibilities for their city and nation. The slums are beginning to be cleared, new flyovers and bridges are being erected, the business people of the world are filling their taxis and rickshaws. As Will Hutton observed, the Indians are ‘genuine innovators’. Some of the best scientists, engineers, chemists and business minds of our generation (no less than 3.5 million per year) are coming out of Indian universities, contributing to the transformation of modern India. Moreover, 75 per cent of the population is aged 25 years or younger. This new generation expects something better than their parents. The Indian design and advertising community are fast-tracking, re-educating, networking in a new way, aware of the mistakes made by their Western counterparts. I noted a wisdom in designer / client relationships that I have rarely observed in London. Mohit Dhar Jayal is typical of the new creative elite. He is the director of ‘A’, one of India’s most focused design and advertising agencies, responsible for Hutch (the Orange brand in India), IndiGo (a new airline) and the rebranding of Nepal. His campaign for Royal Enfield motorcycles, now produced in India, is brilliantly shot with real bikers, including a Rajasthani cowboy. He spoke of the way he builds in a ‘social function’ into every brand he works with. 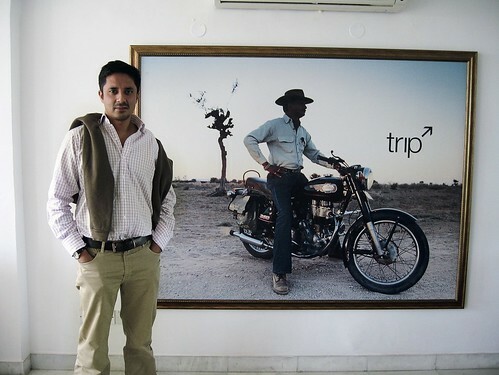 Mohit Dhar Jayal of the New Delhi design and advertising agency ‘A’ with an image from his 2007 ‘Trip’ campaign for Royal Enfield motorcycles. 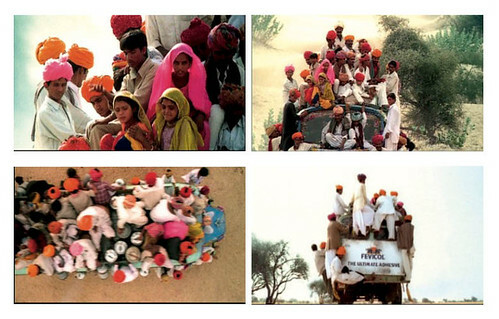 In November 2007, the company announced a merger with global agency Wieden + Kennedy to form W + K India. Photo: Sarah Temple. Top: Stefan Sagmeister holds court to Indian design students at the ‘Kyoorius Designyatra’ conference held in Goa, September 2007. Photo: JLW. At the ‘Doors’ conference, Hannu Nieminen of the Nokia Research centre was keen to highlight ways in which his mobile phones were affecting the ‘sustainable’ lives of his users, such as a fisherman who was now better able to establish fish prices and trade while still out at sea. Piyush Pandey, Ogilvy’s executive chairman for India and South Asia, is pragmatic in his understanding of corporate responsibility: Castrol BP will support 600 villages to manage a drought situation, but, like any brand, expects loyalty when the villagers’ tractors are back in action. Pandey is considered the father of Indian advertising, an inspiration to hundreds of young creatives who have passed through Ogilvy. Seeing his showreel, you get a strong sense that he understands the ‘soul’ of India and where it is going. He provides a special visual connection with consumers: irreverent, full of comic humour, traditional storytelling and genuine humanity. 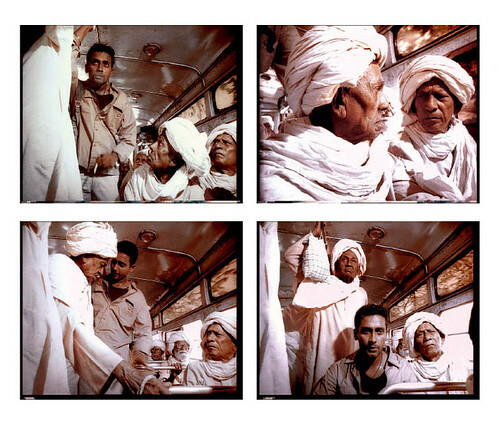 ‘Bus’, a commercial by Piyush padney, Ogilvy India, Mumbai (www.ogilvyindia.com), 2001. Campaign for Fevicol, the household adhesive (‘Fevicol is bonding and bonding is Fevicol’). Kurnal Rawat, creative director of Grandmother India, a small, prolific design group in Mumbai, is one of the key designers defining India’s new visual identity, combining its history and folk culture with its newly discovered technologies, attempting to define a visual language (see Eye no. 56 vol. 14) which is as true to its cultural roots as that of modern Japan. Rajesh Kejriwal, founder of Kyoorius, India’s first design organisation, with a magazine, media labs in several cities and now an annual conference, is typical of India’s visionary new businessmen. This high-powered paper distributor is using his success to put something back, to contribute to the building of a design community in India, involving students and educators, and providing them with links to the professional community and to the business world. Kejriwal is almost single-handedly galvanising India’s creative community: supporting design education with workshops, and bringing in European and American practitioners to inspire the local design and advertising profession. Those doing business with Vijay Mallya, the self-styled Richard Branson of India, owner of Kingfisher beer and India’s fastest growing airline, note that bureaucracy, notoriously sluggish in the past, no longer seem to affect the speed at which business can now be done. Indian designers are anxious to assert that their country is not being seduced by international perspectives, and refuse to become just a service industry to the rest of the world, as Thomas L. Friedman suggested in The World Is Flat. With one of the greatest cuisines in the world, why on earth should an Indian want a McAloo Tikki burger? The interest currently focused on India may be in part a humble realisation by the West that India may have something to teach us. We are not talking ‘lost Westerners clutching their yoga mats’ in search of a guru! I am suggesting a fascination and quiet admiration for a nation genuinely in touch with its culture, history and shared sense of morality and social responsibility. When I walk down a typical British high street, why is there so little sense of the kind of spiritual wellbeing that I experienced in the crowded back streets of Mumbai? Design and business are working together to ‘put something back’. Balla Industries and Tata, India’s biggest steel manufacturer, are ploughing profits back into mobile literacy programmes and telemedicine centres in rural India. Cyrus Oshidar, formerly of MTV Mumbai, explains that he finds India the most exciting and inspiring place to live and work. He talks about its energy, irreverence, its sense of community and natural eccentricity — when everyone lives by their wits, a strong sense of survival seems to generate a spirit which defines a nation. ‘The dreariness of working in London bored me to death,’ he says. The mechanical, sanitised UK environment caused him to flee Saatchi’s and inspired him to return to India to work for Pandey before moving to MTV. As we move towards service design, with the physicality of products becoming less important, maybe human-centred design will be at the heart of what communicators do. Perhaps we could look at Indian advertising and note the way it seems to capture and understand genuine human motivations better than in the West, where the public are treated as consumers. Everyone – financial traders, street vendors, academics, cooks in the Langars (free community kitchens), advertising executives, toymakers or master craftsmen – acknowledges the shift that is under way and the speed at which it is occurring. Generally, they seem well prepared for it, and business is booming. India is a subcontinent of many different nationalities, religions and languages, but refreshingly this period of change seems to be uniting its people in a common aim, and giving India the world recognition it deserves. I observe and impressive, almost religious attitude to recycling, a commitment to organic farming and buying local, and a respect for the equality for women. This huge country of vegetarians, of pacifists, respectful to the oldest members of their community, with women in key roles in government, higher education and business, seems to be coming into its own – and not merely in economic terms. The model they provide is exciting for education, for the design profession and for business. With such a huge young population, their unique combination of intelligence, humility and a moral integrity has much to teach the West. 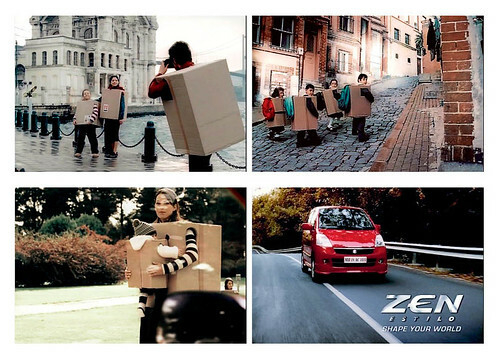 ‘Boxes’ ad by Piyush Padney at Ogilvy India for the ‘boxy’ Zen Estillo car, 2007.